Don't get too down. It took me about 2 months before I got my first sale. I don't think your beads are expensive at all. I'm in love with those little red hearts and the purple posy beads. On your newest pendants (the heart and circle) I would try to redo your photo if you can. When I looked at it, it was very fuzzy and hard to see any detail. But the rest looked fine to me. I struggle with my photos also, since glass reflects so bad. But just keep it up. It will take time and a lot of hard work, especially getting the word out. Blog about it, if you have twitter or facebook, post on there, hand out business cards, etc. I'm not an expert (I've only had 13 sales) but I know this is what it takes. I do think the economy plays a part, too. But at a business meeting my husband gave a year and a half ago, he made the comment "I will not give in to the economy" and said, tell yourself this over and over. If we get the right mindset, it will help. Love the beads. If you still need photos done, PLEASE call my son! He can use the work! 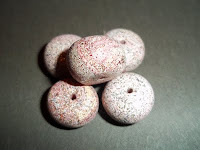 I am forwarding your blog on to my friend who LOVES beads and does a lot of crafting with them... I know she will be happy to see them...I already told her about them, and I know she will likely buy some, soon. (She's in the process of moving, though, so give her a little time!) :) The beads are lovely... I just don't do things with beads, myself, but am happy to recommend them to others!! Hi well I just looked at your Shop and it is my feeling that your prices are the going prices! I don't think you are over priced. If someone loves what you have..they will buy it. Thats just like you and I as we do the same. Hang in there Sales will come..sometimes it takes some time. Believe me I too know the ups and downs of selling in a Shop! Welcome to etsy! Your shop looks great. My address is 25340 Shakeridge rd Volcano, Ca 95689. My only suggestion on your site is to find a background you like and make sure the page we see is the same. I struggle with picture taking too. Your beads are great! I just finished making up a necklace using your beads. I will try to get some good pictures of it tomorrow. Basically I think you just have to be patient. Keep adding things to your shop, be as descriptive with your tag words as possible to make sure you'll pop up in the searches people do, and advertise through your blog and fb, etc. What's a good way of doing this is to host giveaways on your blog every now and then, with commenting on the blog as one entry, and addition entries for sharing your shop link ( or fancy banner or button if you have one ) on THEIR blogs, fb's pages, twitter, etc.